What are the roads like in SA? In a word excellent. 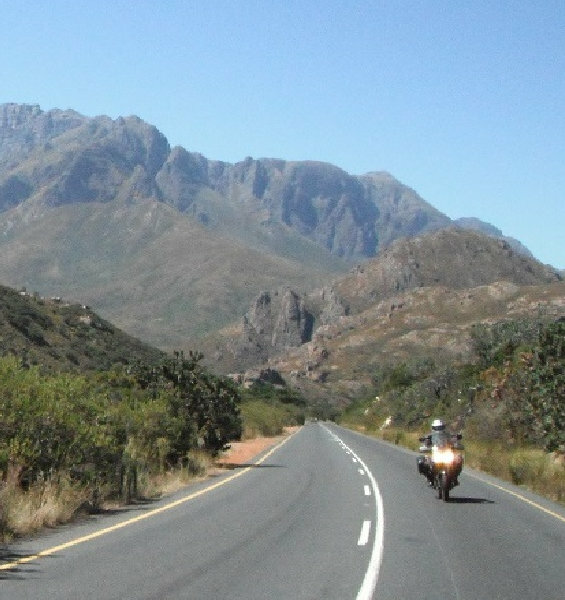 South Africa has some of the most incredible motorcycle riding available on the planet today. A network of high quality tarmac road stretches far and wide across the country. The road surfaces are by and large maintained very well. The network of roads links the beautiful countryside to many cities, villages and hamlets along the way. We will be riding exclusively on these tarmac roads. How will we be accommodated? The overnight accommodations and restaurants offers superior quality cuisine and a great place to unwind and relax after absorbing days on the road. We avoid the humdrum sterile chain type accommodation and restaurants like the plague. Fuel is inclusive of the cost. Although South Africa, being the diverse country it is, has several national languages. English is spoken and understood by the large majority of the population. In addition your tour guides are both proficient in Afrikaans (an indigenous South African language with its roots in Dutch) which is also widely understood and spoken across the various people groups. English is well understood and spoken by all in the tourism industry (hotels, tourist attractions etc.). South Africa has no specific health issues related to diseases and immunizations are not required. We may be in a low-risk Malaria area (Mpumalanga, Low-veld Region) for a few days and you are free to make use of anti-malaria medication. Most overnight accommodation however falls outside the high-risk Malaria areas and mosquito repellents should be sufficient for personal comfort in the evenings.